Las Vegas is an adult playground whether you're into gambling, partying, or simply experiencing a range of fun activities. Currently, the 'Sin City' has experienced lower than normal tourist numbers and there are better deals around than ever. 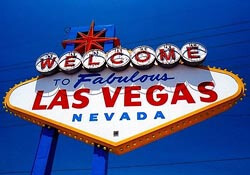 The Las Vegas Hotel Guide specializes in helping you find the best hotel deals at the best Las Vegas casinos and hotels. 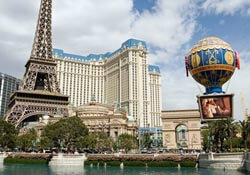 The site brings together the best current Las Vegas hotel deals in effect at the moment. 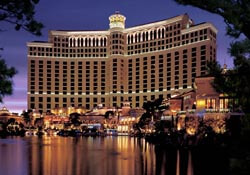 For example, there are specials on for the amazing Bellagio Hotel and Casino (pictured right). Other great hotels running special deals are Circus Circus at just $45, Luxor with rates from $69, and New York New York selling rooms from a bargain $89. All these put you right in the action on the Las Vegas Strip, where you'll have easy access to the spoils of Las Vegas. The other part of what the guide to Las Vegas hotels does is hotel reviews. Luxury destinations such as Bellagio, New York New York, Monte Carlo, Luxor, Mirage, MGM Grand, and more are reviewed with details on the facilities, dining, entertainment, and shopping. Of course, being Vegas, all of these hotels are offering a comprehensive range of each. You can find pretty much anything, from on site gambling to fully equipped gyms in these hotels. As mentioned, tourist numbers for Las Vegas are down and the offers better than ever. If you have some time off coming up, you should plan for a bit of fun in the desert right now. There are so many promotions running that you won't be able to beat them next year! Last updated by jack on 28 September, 2010 in Lodging. Doing a little research before planning a trip to Vegas can definitely pay off! There are alot of promotions and deals running all the time if you have the patience to look around. This way, you'll get to spend all that extra money on the slots!